I thought I'd introduce myself here by posting a clip of me trying to playing the first solo of Mr Crowley. 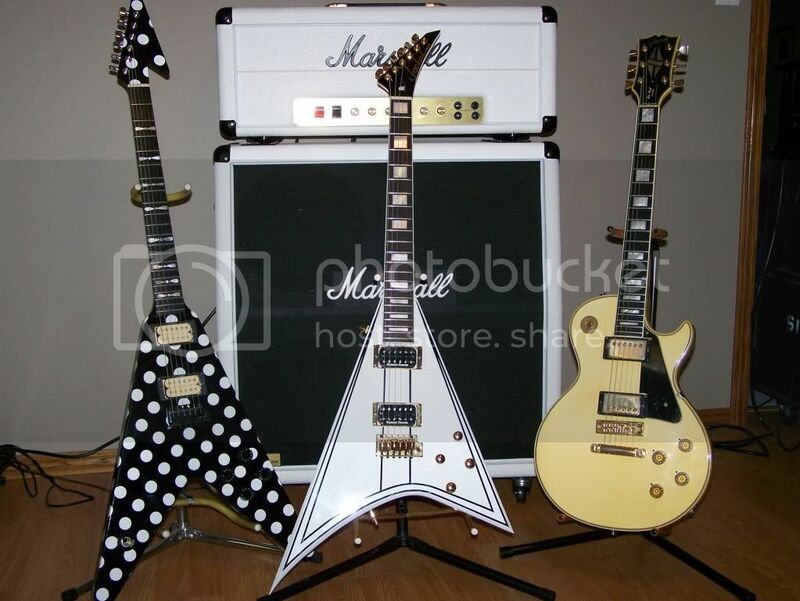 I checked this site out a few times because I'm a big fan of Randy Rhoads. It is awesome to see such fan dedication. I never tried to play his solos before because they were just way beyond me. I've managed to sus out a few now and get them to a reasonable standard. Learning his solos has made me an even bigger fan, you don't realise completely how brilliant his playing was until you try to play it yourself. Here is my first you tube clip of me doing "that" solo with the isolated backing track I downloaded here. The audio quality is ok, the video is webcam quality. I still don't always get that nice percussive pick attack on the first downhill run. Great introduction to the board and wonderful playing! Welcome aboard! Obviously I'm not happy that happy with it, although I should just be wrapped that I can more or less play it. I don't always get that agressive pick attack and I'm caught between the tribute and studio versions. So the ending of the solo needs more work. Sometimes I play it bang on correct and freak myself out, but i havn't managed to capture that on candid camera yet. The tone isn't too far off, nice and midrangey, but I can't help thinking that a MXR 10 band will help to nail it better. In those Randy Rhoads Seminar recordings, you can hear he is frustrated with his tone and asks for a eq pedal, the eq was kicked in and things sounded alot more like his tone. Sounds good.Takes guts to post a video of your playing.Keep up the practicing and video. Thank Dude. I just listened to your RME clip, you have got it suused. It would be great to hear you do it with the 1959 RR and a backing track. I play that one to and find getting the chugga chug trill bit harder to get sounding right than the lead break. I got my MXR 10 band EQ yesterday and Iam wrapped with it. It adds that certain something that was missing. I also got a guy here in NZ called FuzzieBro to build me a NOS TS808 clone that has a daul switchable Keeley gain boost, it's the best OD pedal I have ever used, oozes singing sustain. He said he can build me a handwired vintage parts 1959 with custom wound OT/PT/Choke. I wouldn't mind getting hold of a schematic of the RR and following that for the build. It's Mr Crowley Solo#2 with a bit of my own stuuff tacked on the end. Want to do a revelation one next.